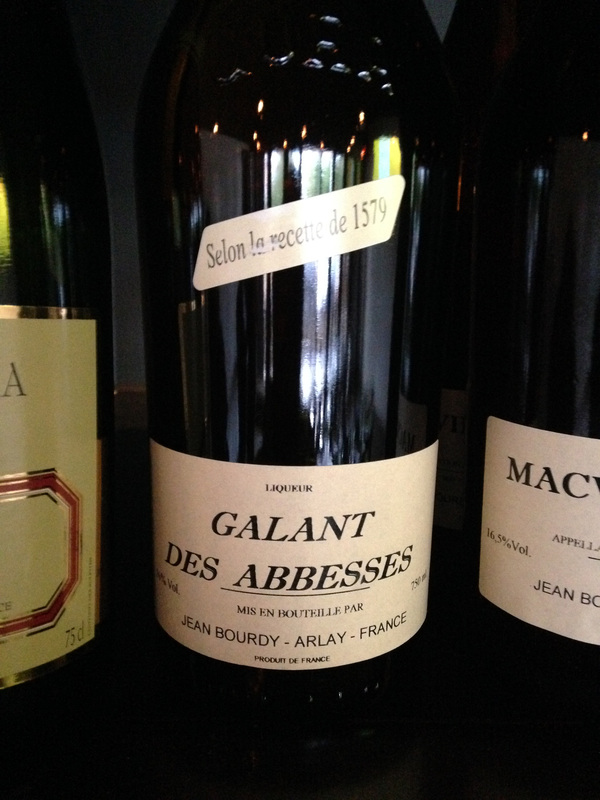 The Jura wine tasting dinner at Selden Standard was going strong, and we were getting to the main entrée. The two stars of the evening were coming, not to mention a special surprise bottle of wine. Our host Elie Boudt of Elie Wine Company and his guest was Jean-Francois Bourdy of Domaine Jean Bourdy from Jura. Most of the courses were designed to be shared, but the entrée of Grilled Trout with fennel, fingerling potatoes and salsa Verde were individually plated. The wine that was served was one of the Jura regions most famous wines, and the wine that was paired with the entrée was Bourdy Cotes du Jura Vin Jaune 2006. Vin Jaune, which means “yellow wine”, came into existence in the early Nineteenth Century, when a forgotten barrel of wine was discovered. The Savagnin grape had been grown in the area and recorded since the Thirteenth Century and had been called “age worthy wine” and or “frost wine.” The grapes were traditionally harvested when frost arrived to the area. After the grapes have been pressed and placed into fermentation tanks, a long fermentation period ensues, the wine is then drawn out of the tanks and into used barrels, but not full, to leave a pocket of air, which is not the normal way most wines are made. 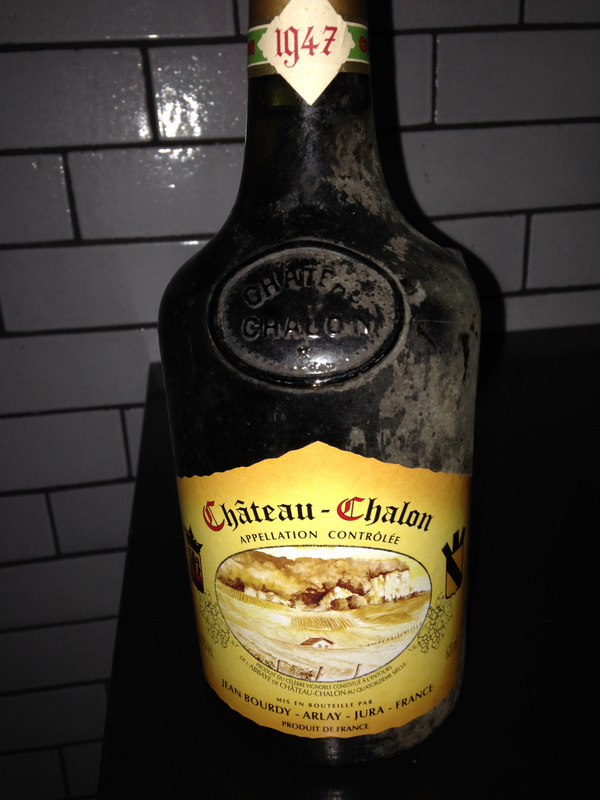 Instead of producing vinegar, which is what one would suspect, this classic nutty and distinct wine is produced. This air pocket is what allows the voile, a film of yeast that covers the surface of the wine, and it is what causes the unique “yellow” of the wine. This voile is similar to the concept of flor that is found in the production of Sherry wines, and a similar process in the production of Tokay. The wine in the barrels are stored this way for around seven years and tested twice a year in this state, before the wine may be bottled. With the extra work and aging in the production of the wine, Vin Jaune can be enjoyed immediately after bottling and can still be enjoyed fifty years later. 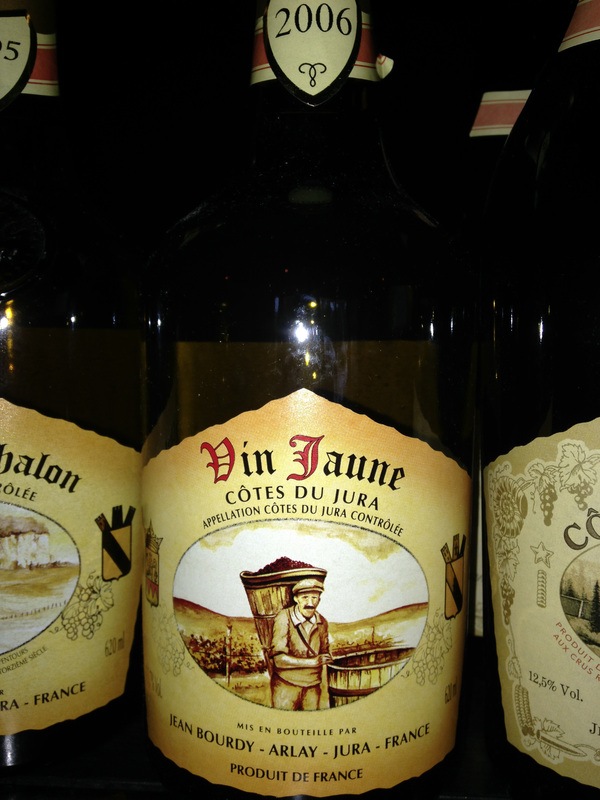 Even the bottles used and they are a trademark of Vin Jaune, is unique like the wine. The bottles are shorter and squat and called a “clavelin” and they contain 620 ml. 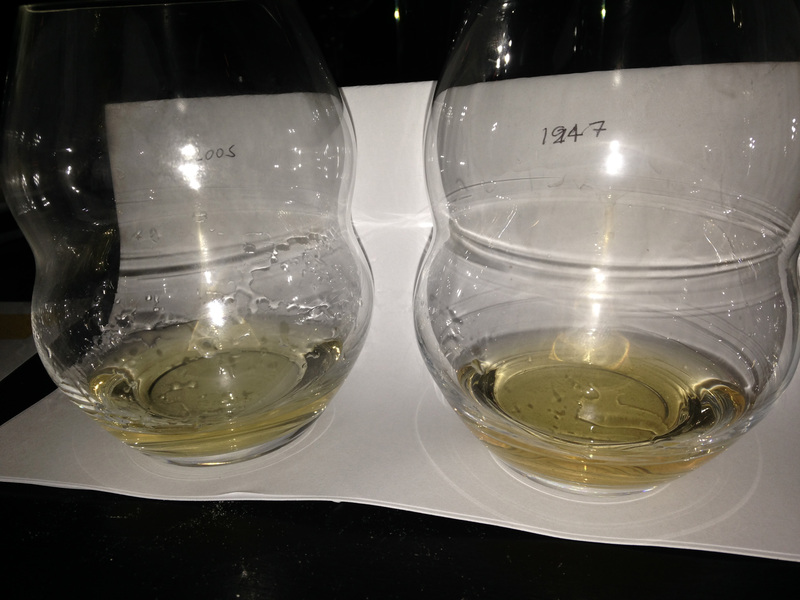 The quantity corresponds to what remains of one liter of wine following the required aging in the barrels. Even with the new government rulings that standardized wine bottles in France, there was such a strong opposition from the wine growers of Jura and their intervention that the clavelin is still around. In spite of the government, it is the only bottle whose volume is 600 ml. Finally for our dessert, which I was kind of sad to get to, because I knew the evening and the tasting was drawing to a close, was an Apple Tarte Tatin with goat cheese ice cream and rosemary Carmel. We all had a chance to enjoy a tasting of Bourdy Galant des Abbesses NV, which is a fortified wine and perfect for after dinner, in fact even an intermission cigar would have been a great choice with it. This beverage is very unique that the juice runs from the press and placed in a copper cauldron, to which twenty-five precisely weighed Indian spices are added from a closely guarded recipe from the year of 1579. The cauldron is then heated to reduce the liquid. It takes an entire day to cook one batch, the heated grape juice is put into a barrel with one third Marc de Franche-Comte, an eau-de-vie brandy made from the same grapes, and it is then age for five years to achieve total maturation. As one can readily see, there is nothing that is hurried in Jura and life is much slower and appreciated even in this fast technological age that we are living in. 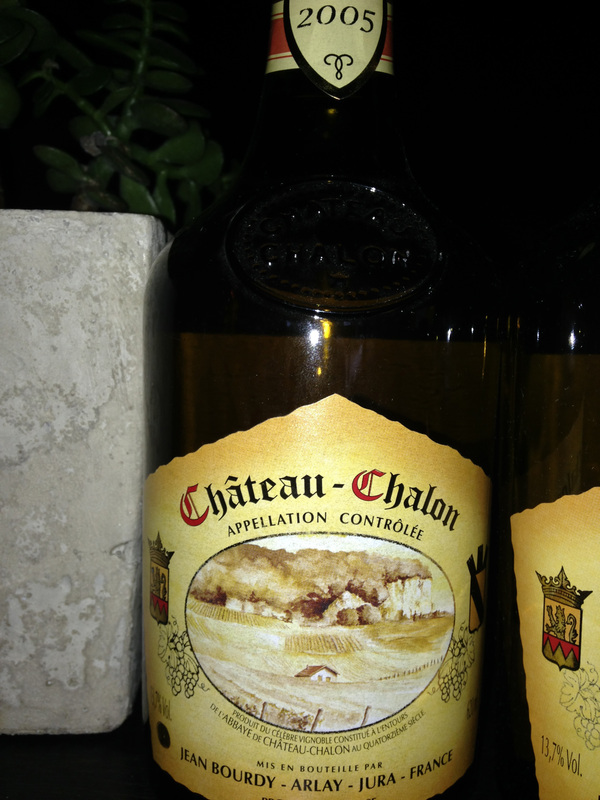 This entry was posted in Dining, Wine and tagged Caves Jean Bourdy, Chateau-Chalon, France, Galant des Abesses, Jura, Savagnin, Vin Jaune. Bookmark the permalink. Anatoli, it was a wonderful evening of wines, and wines that one does not usually find, which made it even better. They were all new to me.